Hi ladies! How has your weekend been? Sorry for the lack of posts last week but if you follow me on Twitter (and if you don't perhaps you should!) you'll know I've been sick all week. Gosh I am such a weakling haha. Unfortunately I've been very behind on product reviews lately so I'm trying to get through them slowly but surely. I have so many exciting products I want to share with you all! I was very kindly sent a selection of Hawley Beautysnapz to try out an embarrassingly long time ago and here is my review of them for you finally! "Beautysnapz are a clutch hit. Indispensable and clever beauty fixers, Beautysnapz go anywhere you go to tackle every job and solve all beauty emergencies.. Fuss free, carry on safe, compact, convenient and always ready without the need to refill containers or waste product." Each pack comes with 24 applicators and the applicators are filled with a pre-measured dose of advanced formula for a handy one time disposable use. They come packaged in a clear plastic container which is small enough to pop into your makeup bag or evening clutch. They are EXTREMELY handy and are very easy to use! To use, all you have to do is hold the applicator with the coloured band upright and bend the tip to the side until it snaps. 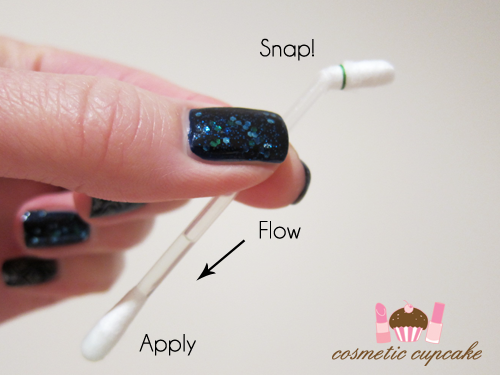 The liquid will then flow to the opposite end and fill the tip and then you're ready to apply! For the purposes of this review, I thought I'd tell you about my two favourites and most used from the range which are the Eye makeup remover & corrector and Cuticle conditioner. I have quite oily lids and my eye makeup ALWAYS seems to smudge and end up on my lower lash line. 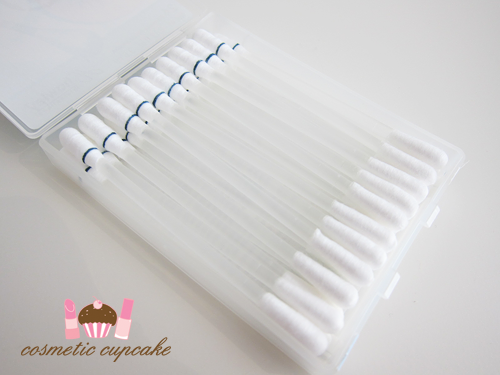 Without fail X( I used to carry cotton tips for cleanup using water but the Eye makeup remover & correctors are a lifesaver! They contain Aloe Vera and Vitamin E and remove the unwanted makeup from my lash line easily and quickly. They leave my eye area feeling smooth and are fine for my sensitive skin. 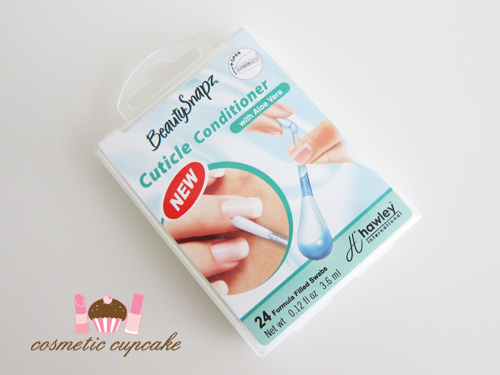 The cuticle conditioners are fantastic for on the go as well. I use these usually on the way home from a hard days work (HA!) for a quick moisture boost for my cuticles. They contain Aloe Vera and the oil is surprisingly quick absorbing and leave no greasy feel like creams and other cuticle oils can. I love using cuticle oils but the greasy feeling it leaves makes using it on the go difficult so these are very welcome in my collection. EDIT: 1 applicator is just enough for all 10 of my fingers. For those with smaller nail beds there is more than enough oil! Overall: I think these are fantastic for on the go and are a staple in my makeup bag. 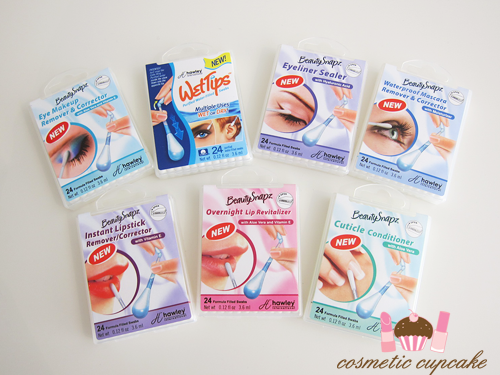 Beautysnapz are so convenient - they fit nicely in my makeup bag or even a small evening bag which means I don't have to lug around a bottle of cuticle oil/cream or clean up my eye makeup dodgily. You can use these everyday or only occasionally which is the beauty of one time use products. Would I repurchase: Definitely! I just repurchased the Cuticle Conditioner ones for myself and the Overnight Lip Revitalizer for my sister. She hijacked a few when I received the samples you see! Details: Beautysnapz are $5.99 each and are available from Big W stores across Australia. A huge thank you to Wendy for sending me the above products to sample! I was sent the above products for my consideration but this in no way influenced my review in any way. As always, my reviews are my 100% honest opinion. These seem very handy to have in my bag! Definitely going to grab some. I was wondering if you could say something about the overnight lip revitalizer? I have really dry lips, so it would be nice to know if I should think about buying some. Also du you know if they are sold outside Australia? How much does one aplicator last for... the cuticle oil, one applicator for all 10 nails? 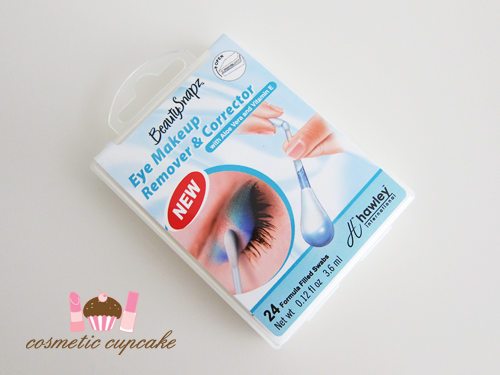 And the make-up remover - one for both eyes... or? @Litzy: The Overnight Lip Revitalizer is a sweet smelling oil that feels lovely on the lips. I've used it a couple of times and my lips have felt noticeably softer and more hydrated by morning. My sister has been using them very regularly during Autumn/Winter and loves them. Oh yes it would probably help if I included how many fingers the cuticle oil can cover! One applicator is enough to cover all 10 fingers for me. I have large nail beds so it's just enough but for smaller fingers it's plenty. I don't actually use the eye makeup remover & corrector to remove my entire eye makeup - I only it when I'm out and about to remove fallout etc. I hope that helps Litzy! great review! i never realised how much of a range there was ... one for almost everything! thanks for sharing. These look awesome, I've been having trouble finding them at my local Priceline so will see if my BigW has any. The cuticle oil is a must! great review 'chelle! i never knew there were these things around haha! thanks for sharing--too bad it's only in Australia! Ohhh the cuticle conditioners seem like such a good idea! I wonder if they're okay to be used on sensitive hands. . .hmm. My hands are super sensitive and my cuticles always look terrible! I might give these a go and see what happens! Get well soon! Everyone seems sick these days! sorry I didn't mean to put my link! but seriously these look like they'd be so useful! @Faye: Thank you so much Faye =) I feel much better now and not so snotty haha. 7 products doesn't sound like a huge range but it actually is! @Adeline: They are super handy. Definitely get some yourself!! @emmabovary: The website says they're available at Priceline but I haven't seen them there myself. I get them from my local Big W. I hope you find them hun! I got my Vitacreme B12 from Colour Mix but it's also available at Sasa too! I use it regularly as my night cream and during the Winter in the morning and it's great for my sensitive skin. Very moisturising and it doesn't break me out! I hope that helps you =) Thank you! Now my dad is sick though haha. @Katie Elizabeth: No worries Elizabeth. Beautysnapz are indeed very useful! At least one packet lives permanently in my makeup bag! Thanks for letting me know! I also have eczema and dermatitis on my hands and it always puts me off doing my nails. I don't even have a regular hand cream because products either irritate or are not moisturising enough. So I have crinkly and old looking hands! Seeing your pictures of beautifully nails makes me inspired to get my hands in tip top condition so I can jazz them up! Chell, what a nice post. This beautysnapz seems to be very good.